The North of Westeros is filled with great forests, barren plains, rocky shores, and snow-capped mountains. From its northernmost edge at the Wall to the swampy marshlands of the Neck, this cold and unforgiving land is ruled by House Stark from the great citadel of Winterfell. The Starks are honorable rulers, governing justly as the Wardens of the North, but they once reigned supreme as the Kings of Winter. 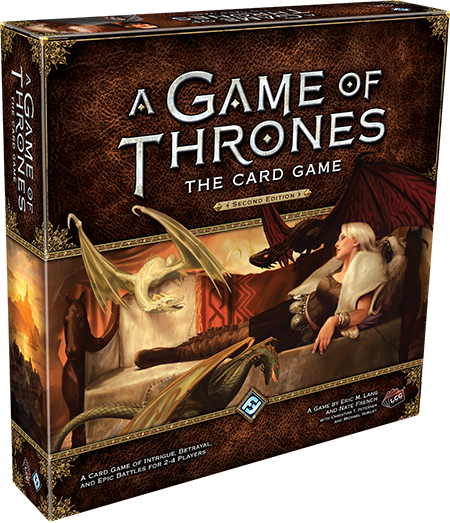 In A Game of Thrones: The Card Game Second Edition, you can lead House Stark southward to claim the Iron Throne and retake the ancient title: Kings of Winter. In our last preview of A Game of Thrones: The Card Game, we explored the differences between the one-on-one joust and frantic, multiplayer melee. Today, however, we turn from our previews of gameplay to begin a series of faction overviews, starting in the barren North with House Stark! The Starks in A Game of Thrones: The Card Game are honorable but unyielding, harsh in their judgement and direct in their punishment of those who offend. They have a pack mentality, they understand the notion of sacrifice for the greater good, and they can rally together when one of their own is in trouble. More often than not, they are military aggressors, taking the fight directly to their enemies. This faction is also the natural home of the "Ned" player type (who desires story immersion above all else), and House Stark will be the place where the explicit "nods to Ned" are most frequent. In A Song of Ice and Fire, the Starks are reserved and honorable warriors and leaders uninterested in the sordid intrigues of court. In many cases, they possess an indomitable spirit and an unshakable sense or right and wrong. Perhaps no character exemplifies these traits so well as Eddard Stark (Core Set, 144), a great Lord of Westeros, a member of Robert’s Small Council, and a leader of House Stark. 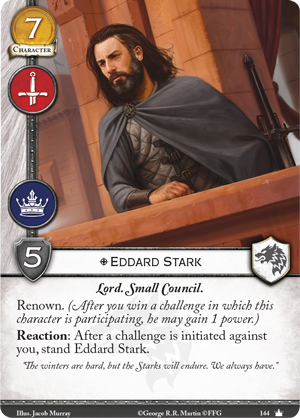 Eddard Stark bears the renown keyword, which allows him to claim a power token after you win a challenge in which he participated. Since you only need fifteen power to win the game of thrones, characters that claim additional power with the renown keyword help you rush to victory much faster. Of course, renown is not Eddard’s sole attribute. He will not stand idly by while the honor of your House is insulted. Because of this, whenever a challenge is initiated against you, you can stand Eddard Stark. With Eddard Stark at your side, you’ll never lack a defender for military or power challenges against you, and with the help of a Little Bird (Core Set, 34), Eddard can even defend you against the vile intrigues of the south. 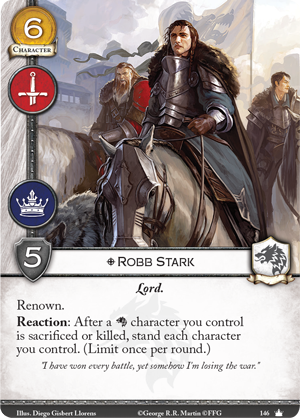 You can also rally the bannermen of House Stark around Eddard’s son, Robb Stark (Core Set, 146). Like Eddard, Robb Stark bears the renown keyword to accelerate you toward victory, but his Reaction sets him apart as a born leader. 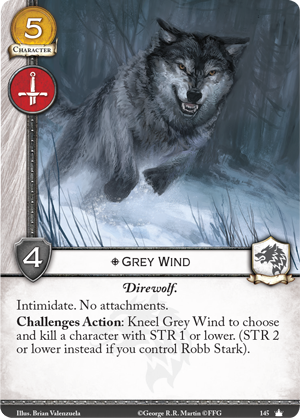 After any Stark character is killed or sacrificed, Robb Stark’s ability allows you to stand every character you control, preparing the way for fearless retaliation or an insurmountable defense! Even losing a military challenge can become a resounding victory in the long run as all of your characters stand and become ready to participate in challenges once more. Robb’s mere presence forces your opponent to rethink how the challenges phase is played. 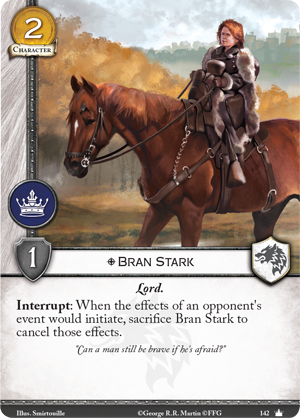 House Stark’s reputation for honor and fair play is well-earned, and several Stark cards in the Core Set help you keep your opponent honest, no matter what duplicity they have planned. 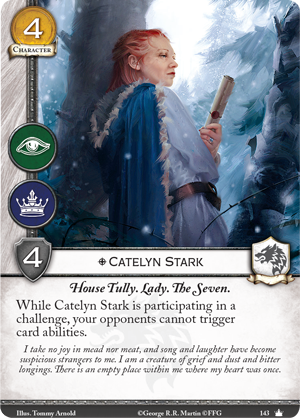 Catelyn Stark (Core Set, 143) is one of the few Stark characters to bear an intrigue icon, so she is already crucial for defending your hand from your opponent’s intrigue challenges. But no matter what challenge she participates in, Catelyn Stark ensures fair play from your opponent with the text, “While Catelyn Stark is participating in a challenge, your opponents cannot trigger card abilities.” By shutting off almost all interference from your opponents, you can fight for the Iron Throne with much more confidence. Naturally, your more treacherous and under-handed opponents will try to slip something past you, such as a cunning event to incapacitate your characters and leave them helpless. 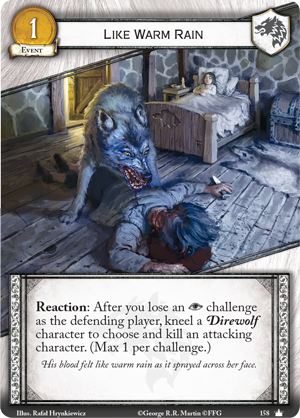 Fortunately, you can neutralize such devious plans with the help of Bran Stark (Core Set, 142). By sacrificing Bran Stark when an opponent’s event would take effect, you cancel the event and keep your characters safe from any skulduggery. What’s more, Bran Stark’s sacrifice gives you another way to stand all of your characters with Robb Stark! The direwolf has long been the sigil of House Stark, and from the first chapters of A Game of Thrones, the children of Eddard Stark have their own direwolves as companions and guardians. 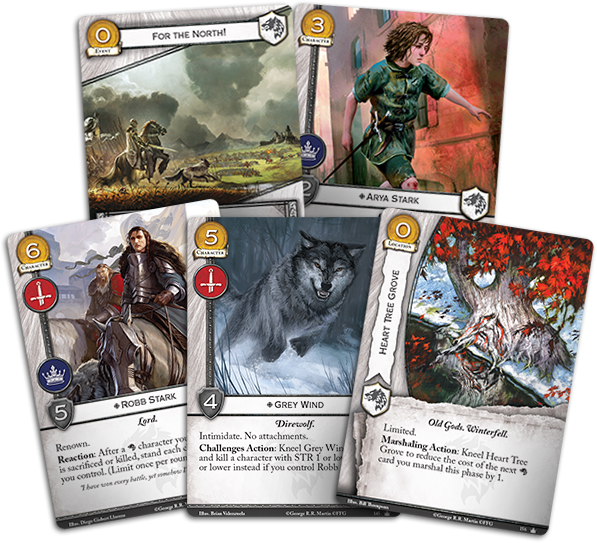 These direwolves are equally important to House Stark in the second edition of A Game of Thrones: The Card Game. One of these Direwolves is Robb Stark’s wolf, Grey Wind (Core Set, 145). Grey Wind can cow your foes into submission with the intimidate keyword. After you win a challenge as the attacker with an intimidating character, you may kneel a character whose STR does not exceed the STR by which you won the challenge. In other words, if Grey Wind makes a military challenge and you win by four STR, you may kneel one of your opponent’s characters with four or less STR. Although you may terrify some of your foes into submission, others must be taught a sterner lesson. During the challenges phase, you may kneel Grey Wind to choose and kill one of your opponent’s weaker characters, devouring those who would aid your enemies. 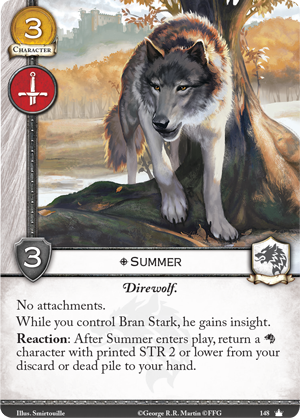 You may also command the loyalty of Bran Stark’s Direwolf, Summer (Core Set, 148). 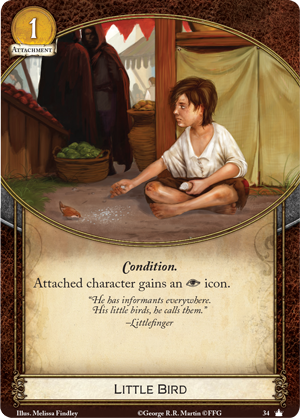 Summer’s special bond with Bran Stark grants him the insight keyword, which allows you to draw a card whenever you win a challenge with Bran Stark. That’s not the end of Summer’s synergy with Bran Stark, however. After Summer enters play, you may return a Stark character with STR two or lower from your discard or dead pile to your hand. Since Bran Stark’s ability requires you to sacrifice him, he’s certain to spend some time in your discard pile. Summer gives you a way to recur Bran Stark and use his event-canceling ability more often. As intimidating as House Stark’s Direwolves are, they’re even more dangerous when they strike from an ambush. You can hide your wolves in your hand until you’re ready to play them with The Wolfswood (Core Set, 155). 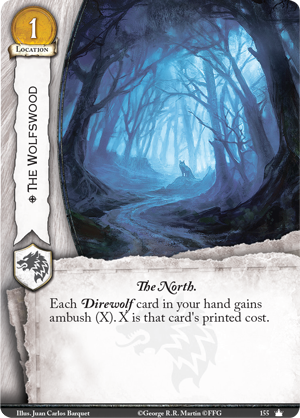 The Wolfswood allows each Direwolf character in your hand to be ambushed into play by paying the character’s printed cost. The ambush keyword allows a character to enter play during the challenges phase when you pay its ambush cost. The sudden appearance of an unexpected Direwolf can quickly turn a challenge in your favor. The Starks are powerful on the field of battle, but their open and honorable personality leaves them open to being exploited by intrigues. Fortunately, Direwolves are known for their vigilance. Even if a cunning spy slips past you, you can ensure that he won’t escape alive by playing Like Warm Rain (Core Set, 158). After you lose an intrigue challenge as the defender, you can play Like Warm Rain and kneel a Direwolf to choose and kill any attacking character. Even saving a gold without actually holding Like Warm Rain in hand can threaten your opponent and make him much more careful when he next brings his intrigues to the North! When you fight alongside House Stark, you stand for honor and justice. You insist on fair play and punish those who try to slip past you. Your armies and direwolves are fearsome in battle, and the cold of winter only makes you stronger. Reclaim the title of Kings of Winter for the Starks! Of course, House Stark is not the only faction that fights for the Iron Throne. Join us next week as we turn west to Casterly Rock and House Lannister.